The weather is heating up here. It gets really muggy and then the thunder showers start. I love the south unreasonably. I have some pictures to share today. 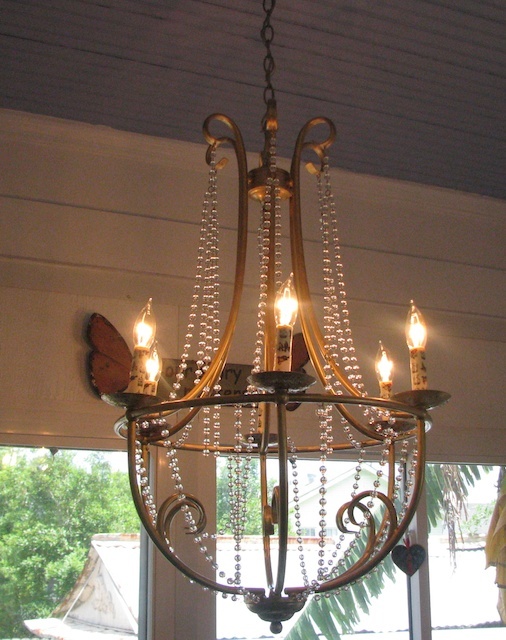 I bought this chandelier at an estate sale in the Marigny. The man who died was an old artist. Maggie showed me the chandelier. I told her I was busy and needed to look quickly because there were so many people there buying his treasures. She insisted I come with her and she showed me this chandelier for $25. I took the bead strings off and soaked them in vinegar for 48 hours, and then in vinegar and dish soap. 60 years of grime floated off. 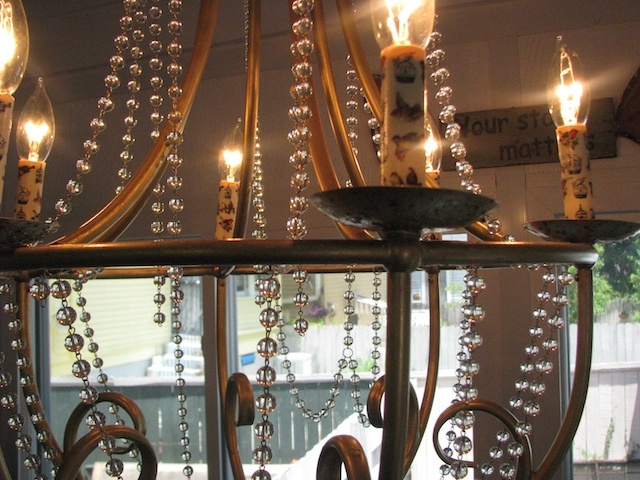 I painted the chandelier with two coats of gold craft paint that I had sitting around. On the underside of the horizontal parts when you look up from underneath, I added brown glitter flakes and gold glitter. I wrapped the candles in washi tape. They came out super nice. You can’t even tell it is washi tape. It cost me $75 to have it installed above my desk. As an added bonus that I didn’t expect, all of those lightbulbs made it much brighter in here. Maggie and Raffi’s dresser for art storage. I bought this dresser at the estate sale, too. It is IKEA and it cost $20. I had some cans of paint from other projects that I wanted to use up. I also wanted the dresser mainly black to go with my mainly black and white studio. The black part is gloss enamel. I love the shine and resilience of enamel. The blue and yellow parts are latex paint. I wanted Maggie’s bees to adhere. 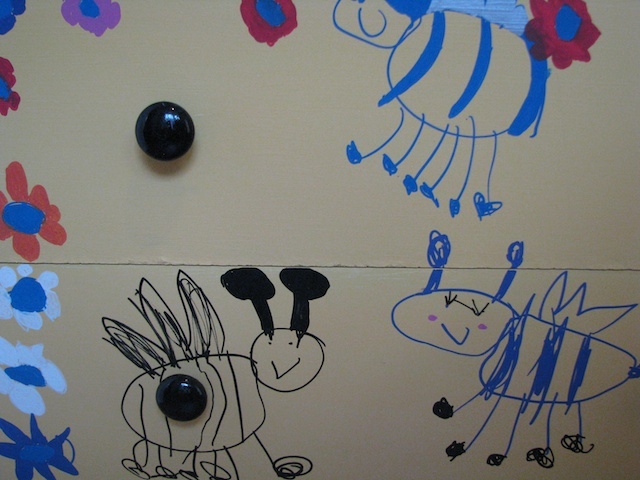 She drew the bees with Montana paint pens. 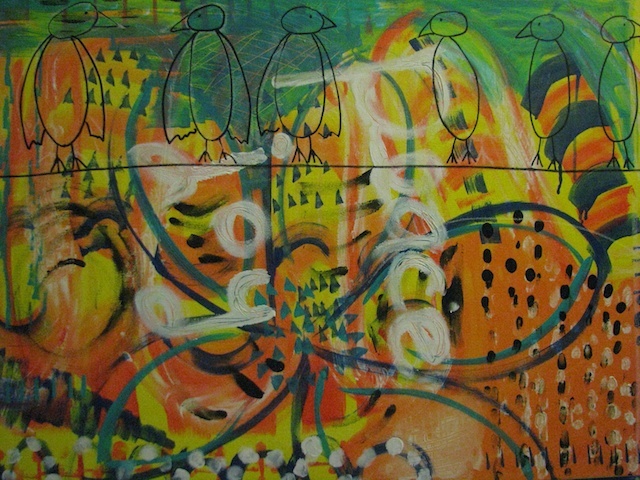 The pens are filled with acrylic paint, but are easy to control, like a pen. 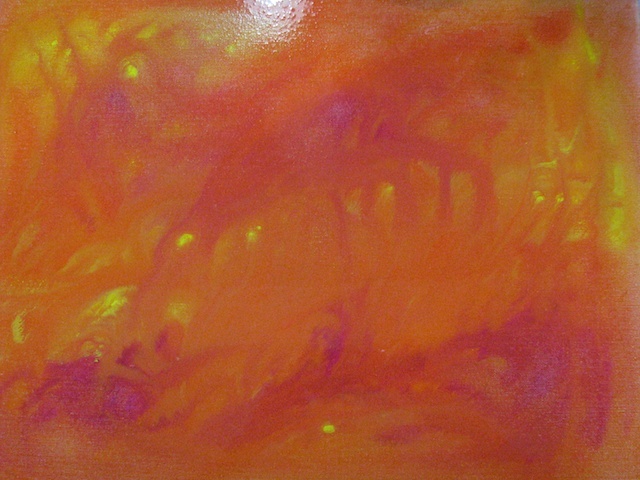 I wanted to see what would happen if I painted a wild background with many colors and shapes as the base of my painting. How much do I cover up of the original painting? I love all the colors, but it is so busy. The little houses got larger. 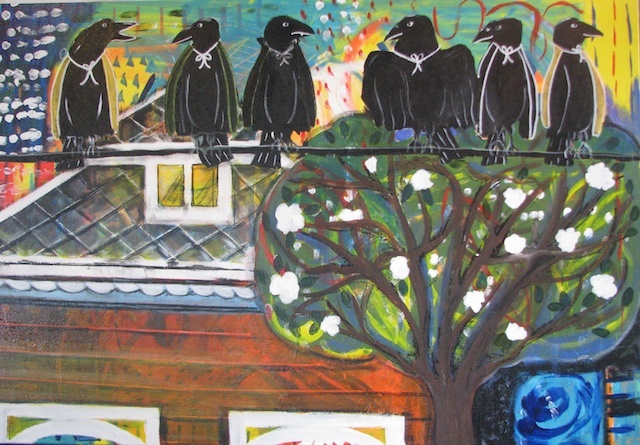 The crows are dressing up. The tree is turning into a magnolia tree. 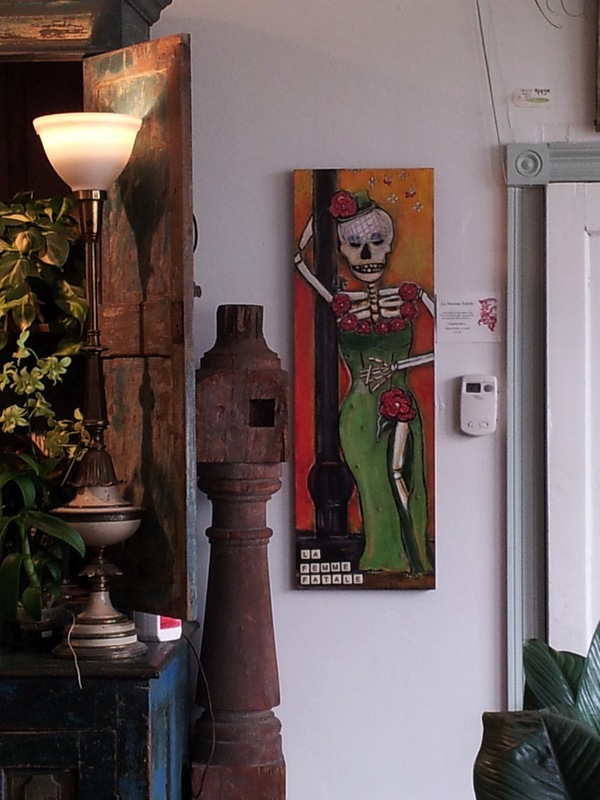 This is a picture of one of my paintings at Urban Roots. 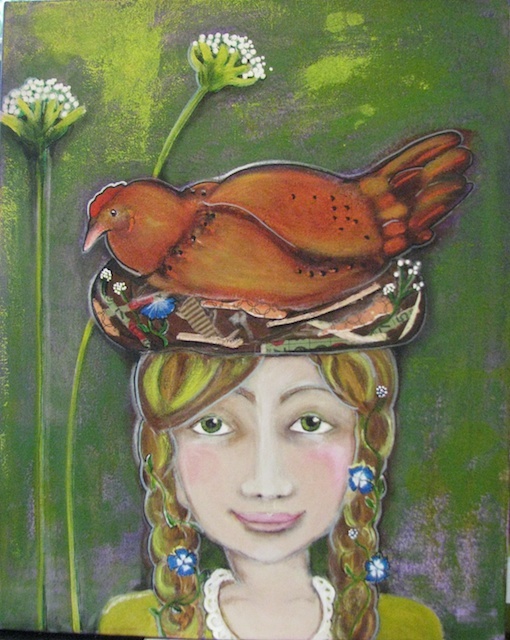 Counting her Chickens and Bee Love are also there. I love that place. I worked like crazy this week. My BFF from California is coming to New Orleans tomorrow. She has never been here before. I am totally excited. Happy June! Today is a picture sharing day. In the garden is finished. I might frame this, but I also like the purple edge. The girl has her hands full. She is balancing her friend on her head. Girls are creative and strong that way. She doesn’t mind getting her hair a little messed up. Cathy and Dennis sent me this picture from their home in California. 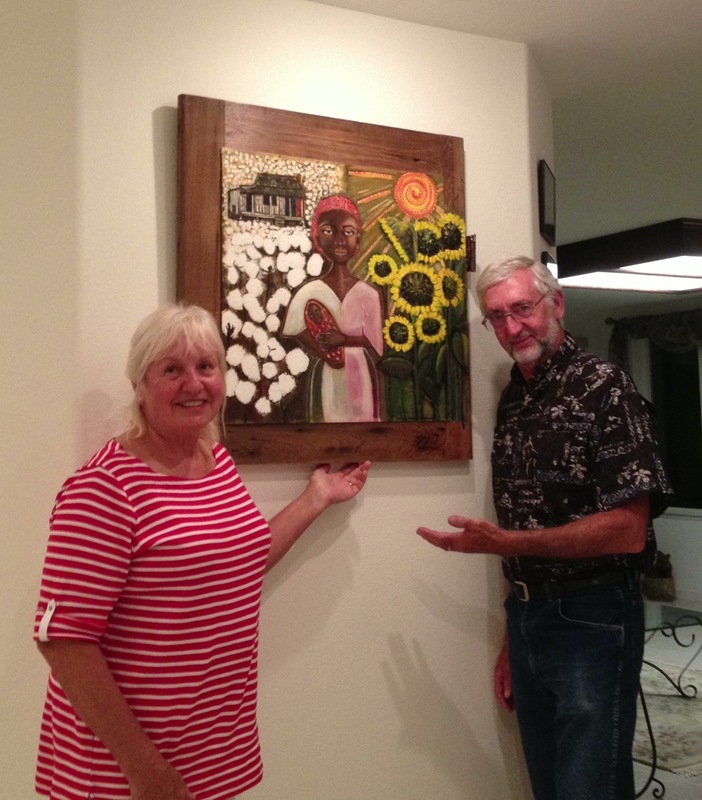 It makes me so happy to see them with the painting. (The nasty voice in my head is fearful of buyer’s remorse.) They said that Heidi from Parcels and Post wrapped it so well, it could have traveled around the world. I call the painting WAITING FOR MOSES. I love what you said about it in your blog when you were painting her. As I remember you were trying to show her in an unhappy place as a slave who had a hard life picking cotton on a plantation, but with the hope of a brighter future for the baby she is holding. The darker side of the painting clearly says this to me and all the brightness is on the right side as the hoped for future. It fit so perfectly for me as I had read and talked with my 3rd graders over the years of Harriet Tubman that many slaves knew and called Moses for secrecy. They called her Moses because she made numerous trips south to lead her people north to freedom. Plantation owners placed a bounty for her dead or alive. Thank you, Cathy for liking and buying Moses. 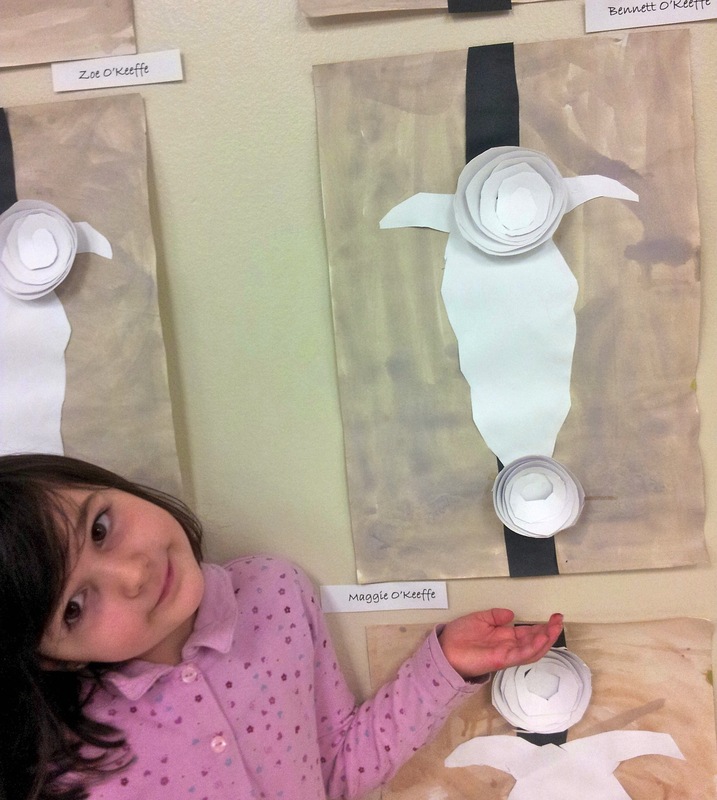 Maggie’s teacher at the JCC taught the kids so much about art and artists this year. Apparently, 4 year olds are little sponges. And the JCC teachers are awesome. 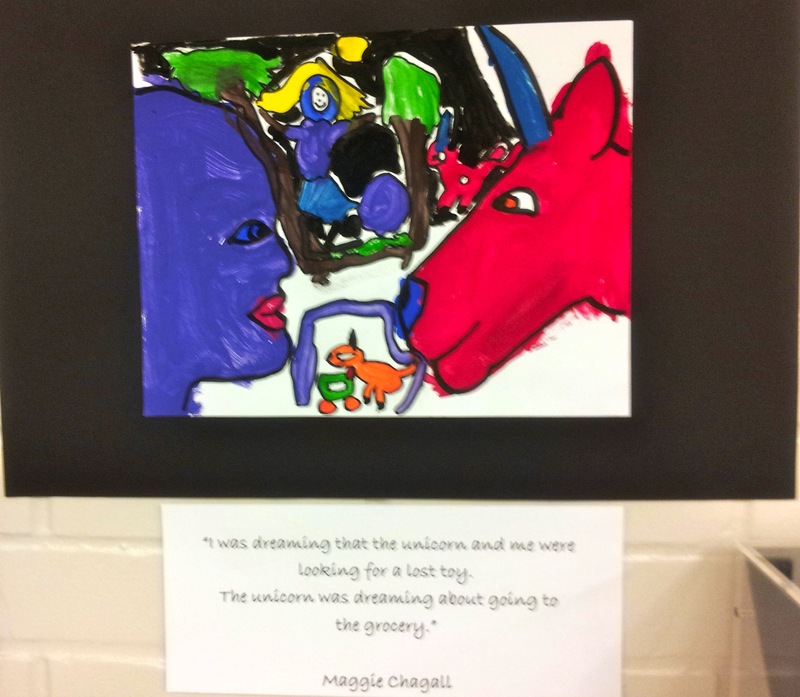 Maggie said, “I was dreaming that the unicorn and me were looking for a lost toy. Now, what’s new with me… and then I will let you go. 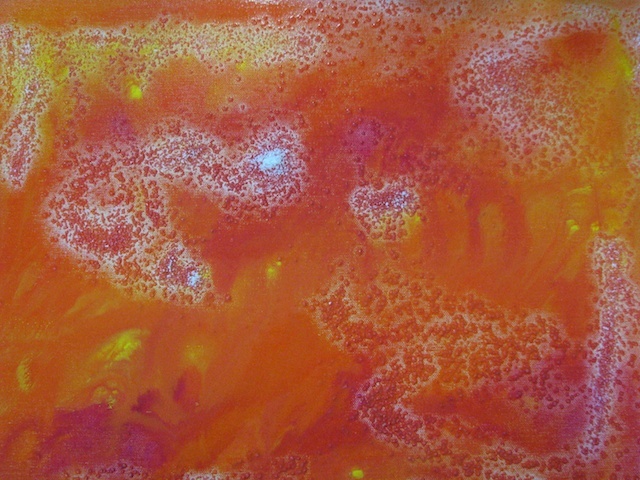 Acrylic paint dropped on canvas with a lot of water. Added Kosher salt. Let dry completely. Brushed off salt into the sink. 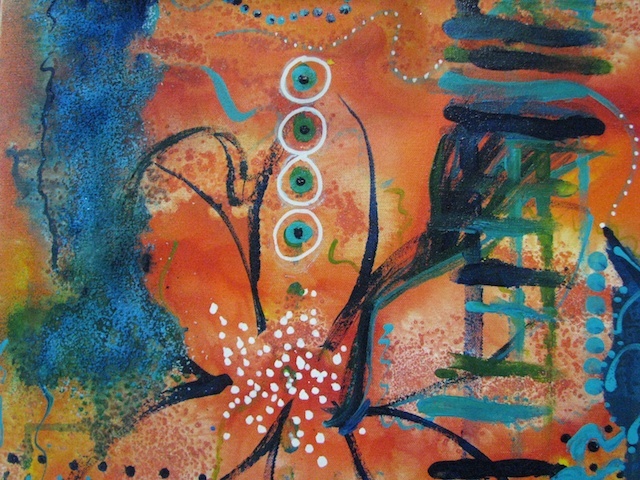 Painted intuitively, whimsically, with abandon. I used brushes, my fingers, more water and a little bit of ink. I don’t know the end version of this painting. 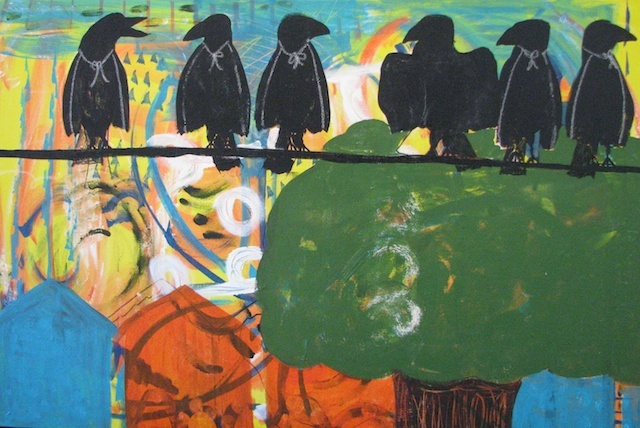 I am hoping a crow turns up… a whimsical crow… with a friend. 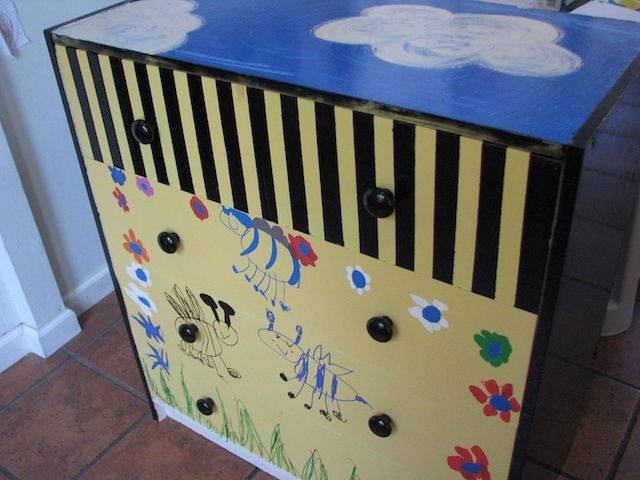 I have been busy painting a dresser and a chandelier. I will show you next week. They are both going in my studio, so I am just having fun with them. filled with good luck, happy celebrations, and love.